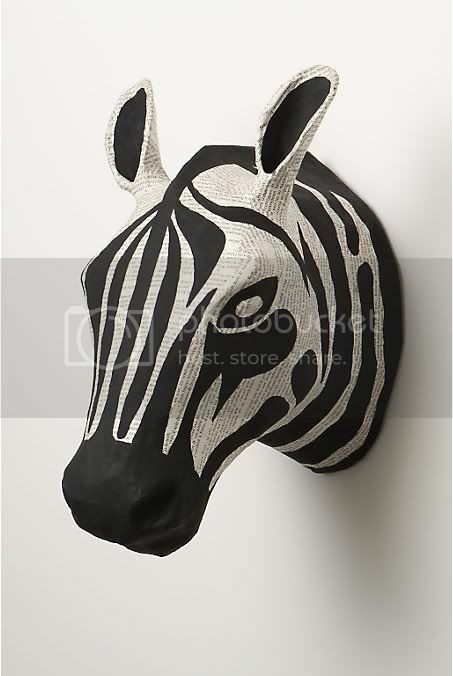 MY FUTURE APARTMENT: WALL DECOR - PAPIER MACHE ANIMAL HEADS! SERIOUSLY! 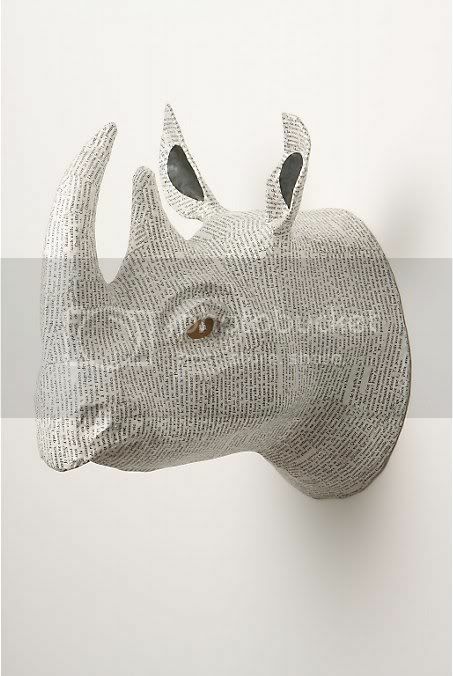 Layers of repurposed cement bags are covered with vintage French book pages to create this handmade, papier mache animal head. I know most people don’t think of putting faux animal heads in their apartment, well I like to think out of the box. It’s funny how much I love these. It’s no secret that am a lover of print, animal print. Of course I don’t believe in hurting animals to appease my style choices, but I like to wear and accessorize with them any chance I get. So it should be no surprise that I would want to add them into the décor of my future apartment. Do you have anything that you consider quirky in your home? Share, pls! Shop these at Anthropologie, but leave some for me!!! Hmm. No animal heads, but I'm doing the living room in a subtle animal theme. 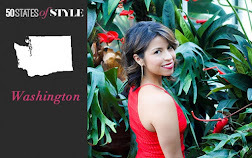 From furry pillows, to a TOUCH of leopard print, to leather print, to croco embossed things, to butterflies, etc. I didn't want to go all "fur" or all prints, but wanted to use the inspiration of the super cozy couch pillows. most people would say my kitchen in quirky filled with birdhouses and bird cages and the such.. But I love it! I love trees(my livingroom decor) and all things accociated with the such, birds, brances, leaves, nest, colors.. I do think these paper heads are great and good conversation starters..can't be mad at that! I'm the gnarliest animal activist I know (you will never see me in animal print ever) but I love these! They rock. No, I don't get it. 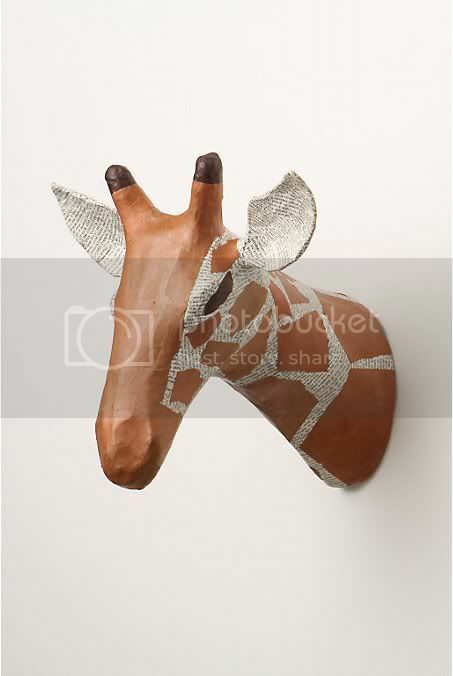 I guess if you want animal heads on your wall, but not real ones. LSR- thats sounds amazing. I just went into a store here in seattle that would have made you keel over and die..everything birds galore. Heather- Funny enough I would be the last person that would want heads real or not on my wall, in my house. But these are just so fun for me and the fact that they are from recycled books and the typed letter being part of the art, I just fell for it. These are amazing! I love how you can see the newsprint through everything. The Zebra is definitely my favourite. The idea of heads on the wall is great. However, like you, I don't like the thought of real heads. But if you are going to have fake heads anyway, why not something cool, like a dragon. Welcome to my world. You can see one on the first page of my website (just click my name). But the animals you show are nice too, even if they wouldn't eat you. These are cool! I esepecially love the newsprint! This could be a fun project. Wooo!